The February issue of Sidecars on Line is available to view and download. Oscar's Odyssey features, “Our Mutual Friend, Roger”. The Vmax Diary this time around is about a further lighting modification. Further news on the Motorcycle Action Group front, plus an intriguing insight into the bizarre world of those obsessed with online gaming, specifically something called Fortnite. Finally, “Scene in a Field”, and images featuring sidecar outfits that illustrate that thing called diversity. Oh, and an early Reliant three wheeler with its motorcycle connection literally sticking out like a sore thumb ! Harley Davidson has joined in with the current fashion/ fad/ obsession - take your pick, of announcing an electric motorcycle. Unlike some makers, the Livewire is pitched with a price, a mere £28,995, plus that "Pre orders open soon". Whilst it's unlikely to suit the hardline Harley guys, the Livewire might appeal to thick wallet fashion types. Range, so much part of the negative view of electrics, probably won't matter for the Sunday breakfast ride around the block, or to a convenient posing location. It's likely that the "Sons of Anarchy" market won't be forming a queue/ line. Valentino Rossi enters the 2019 fray at the ripe old age of 40; Marc Marquez and Jorge Lorenzo team up for Repsol Honda, both recovering from injuries and surgery; Cal Crutchlow on a satellite Honda also comes back after missing the latter half of the 2018 season due to injury; and Ducati appear even stronger after a near miss 2018. The remaining grid is filled with more youngsters capable of giving the established stars a run for their money. Could be another classic season. Kerstin and Kevin Holford, our German based friends' spent three and a half years on world trip through Europe, Asia, Australia, New Zealand, and South America. Problems prevented carrying on into Central America, North America, and Africa, but the whole exercise still proved to be an epic, life changing experience. On their return the pair have embarked on a business providing mobile catering based upon the culinary experiences gained whilst in many lands. 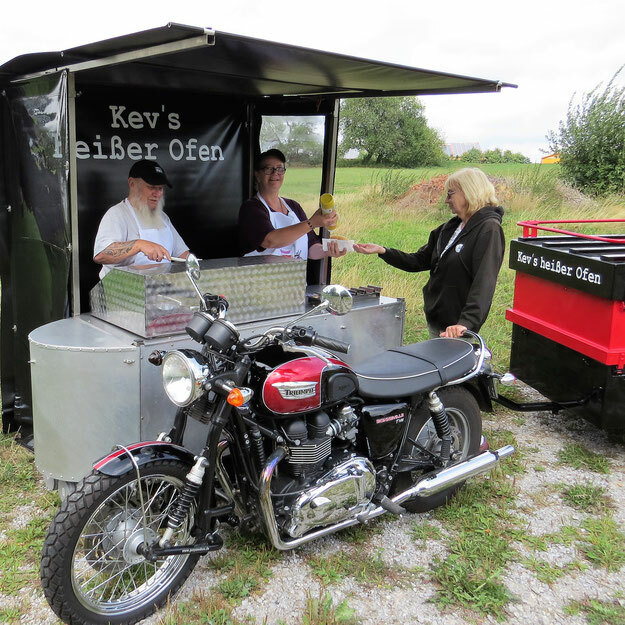 The added ingredient is that the venture incorporates their love of motorcycles and sidecars. OK we know that Watsonian reached a centenary in 2012, but what the heck. The booklet produced for Watsonian Sidecars 75th anniversary is available via our Download page.